Logan Craig on his Dream hunt tagged out with this 214 lb black bear with the hounds of the Beaver Lake Bear Hunters in Wisconsin! The tag was donated by Adam Cuddeback a great friend that teamed up with Trader Inc to make a dream hunt for this kid with hounds possible. The hunt was given away at the Trader Inc Youth Challenge in a drawing!! 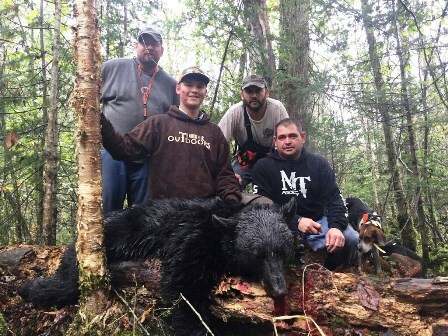 Congrats Logan on a great bear hunt that will be remembered for a life time!! This was truly one awesome hunt! Huge thank to a great guy and awesome friend Adam Cuddeback! Adam and I talked about doing this in may and then we talked to all the guys with the Beaver Lake Bear Hunters and got this set up to do a Dream hunt for a kid to take them bear hunting with hounds! Adam waited 8 years to draw a tag in Wisconsin and he said he would be more than happy to donate it to a youth hunter, so what we did was had a drawing at the Trader Inc Youth Challenge and Logan was the lucky winner! This was an all expenses paid hunt by Trader Inc Outdoors for the youth hunter have a dream come true! The weather was not the best by no means rain and lots of it but the dogs did there Job treeing one but he was a bit too small in what we were looking for. 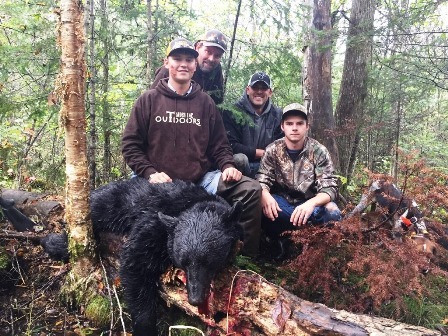 But then later that afternoon they sounded off with one bayed on the ground and Logan got to sneak in and got to shoot the bear at 7 feet! Intense isn't even the words to describe it! Beefs said Logan did an awesome job staying calm and waiting for his shot! Huge thanks to all the guys at Beaver Lake Bear Hunters club Beefs, Booza, Fuzz, LH, Sonny, Cudde, and Dudley for the help for making this dream hunt come true on an absolute Dream hunt that most would love to do!! I am truly blessed to call these guys my friends that go above and beyond to help kids get to the woods and do hunts with them! I have known these guys for quite a few years now and they are always first class and go the extra mile to make sure every hunt is a success! The hospitality is second to none and life long friends come out of these hunts!! Next year come to the Trader Inc Youth Challenge because there will be another Dream Hunt given away and you just never know what it will be!! Great job Trader Inc and friends!!! Nice Job Trader Inc!!! Congrats!! Awesome job!! Awesome job setting this up and making it happen! Reasons like this are why the Trader Inc Youth Challenege is my favorite hunt to attend!! Super job on your bear and a great job Trader Inc for looking after the future of the sport, the kids. Congratulations, that's big bear. Great job Logan and all involved..